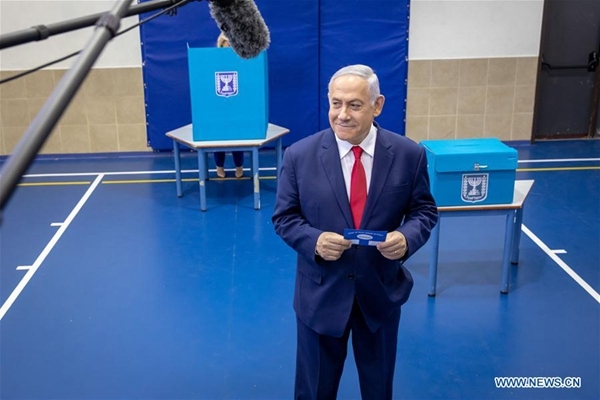 The official results showed that Netanyahu will be able to form a coalition, with a solid majority for his Likud party together with other right-wing and Jewish ultra-orthodox parties. With 99 percent of the votes already counted, Likud party and major rival Blue and White party currently have 35 seats each in the 120-seat parliament (Knesset). However, the Netanyahu-led right-wing bloc has a total of 65 seats, 10 seats more than the 55 seats that the center-left bloc has won. "The right-wing bloc has surprisingly secured 65 seats, an increase from the last elections," said Efraim Inbar, president of the Jerusalem Institute for Strategic Studies. Final results are expected Thursday. A major reversal is unlikely as the margin has been too wide. According to Israeli law, the Israeli president will meet heads of the parties to consult on the person to form the next government next week. And the final candidate will have 42 days to form a coalition. Netanyahu is expected to stick to his foreign policies, especially on the issues of Palestine and Iran, as in the past year, he has gained enormous support from U.S. President Donald Trump, his closest and strongest ally. In 2018, Trump recognized Jerusalem as the capital of Israel, the Israeli sovereignty over the annexed Golan Heights, and resumed sanctions on Iran. The international community has widely supported Palestinian plan of East Jerusalem as the capital of their future state. Things would not change much, even if the Blue and White party had won the elections. "Likud and Blue and White both say pretty much the same thing," said Meir Rubin, executive director of the Kohelet Policy Forum. Saeb Erekat, secretary-general of Palestine Liberation Organization (PLO) executive committee, said on his Twitter that "Israelis have voted to preserve the status quo." Netanyahu has proven that his policies on Palestine have gained wide support among Israelis, said analysts. And Israelis, fed up with political instability and frequent elections in the past years, have voted for stability. "I am very satisfied and I am sure that people of Israel will be satisfied (about the results)," said Jerusalem resident Motti Nehama. "Our country is in a good place," said Aliza Kanyas, another Jerusalem resident. "Bibi (Netanyahu) is powerful and strong." Maya, another resident of Jerusalem, said she voted for the Likud and for Netanyahu because she is satisfied with his leadership and sees no other better candidate. "It is a night of tremendous victory," Netanyahu told supporters who waited to congratulate him. "I am very moved that the nation of Israel trusts me for the fifth time." But his future hangs in the hands of the Israeli judicial system. Netanyahu's victory is overshadowed by three possible indictments on corruption charges against him. In the summer, Netanyahu will attend a hearing with the attorney general, who will decide whether the Israeli leader will have to appear in court. Netanyahu has repeatedly denied all the allegations against him. "It is not clear if the coalition partners will agree that Netanyahu should remain prime minister. But even if he leaves, the Likud will find another leader to replace him," Inbar said.